Condah is a rural village in western Victoria, on the Henty Highway 35 km south-west of Hamilton. It is also on the Portland to Hamilton railway. Condah is the name of a large swamp south of Branxholme, fed by the Arandoovong Creek. An outflow from the swamp, Darlot Creek, empties into Lake Condah, which was an important site of semi-permanent Aboriginal settlement. (Lake Condah was later the site of an Aboriginal mission station, and the whole area is discussed later). 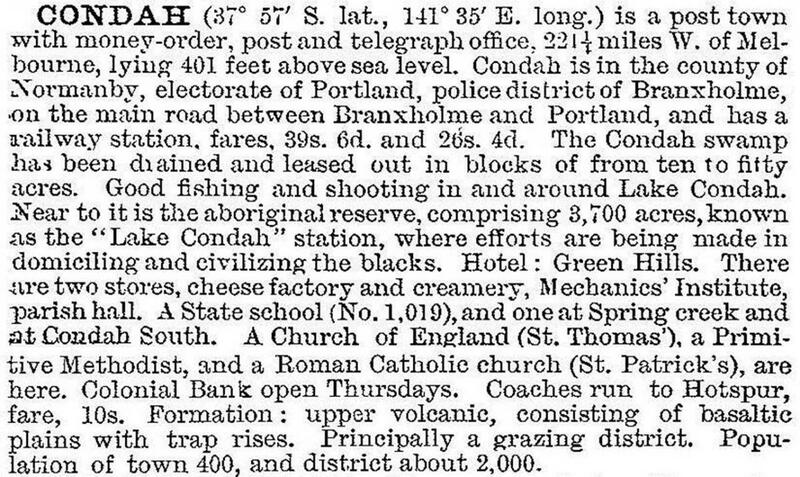 White settlement in the Condah area (which is about 15 km north-west of Lake Condah) began with the Lake Condah pastoral run in 1843. In the following year a hotel was opened along the track between Portland and Hamilton near the position of the future village of Condah. Named Green Hills, the village went by that name at least until the 1860s. Apart from the dominant pastoral properties there were also numbers of sawyers and timber splitters. During the next decade farm selections were taken up, and three schools were opened in the district during 1871-76. In 1877 the Portland to Hamilton railway line, via Condah, was opened. The closer settlement farms underwent amalgamation and two of the schools were closed by 1913. The census populations halved between 1911 and 1933. Despite that, the Condah cooperative cheese and butter factory had good turnovers, processing milk from Branxholme farmers. Of the features mentioned in the description of Condah in 1903, the hotel, the mechanics’ institute (rebuilt in 1903) and the recreation reserve have been retained. The last school closed in 1952. The three former church buildings have survived along with the dairy factory and general store (closed 2000). There are remains of the railway station complex. The Condah district is better known for Aboriginal settlements. At Lake Condah, on its south-west side, there are extensive remains of fish traps and shelters built from the local scoria stone. The lake is near the western edge of the volcanic material erupted from Mount Eccles. All of Lake Condah and the Mount Eccles National Park are registered on the Australian and Victorian historic buildings registers. Mount Eccles’ crater contains Lake Surprise and the surrounding woodland is of high biological diversity. The site of the former Condah Aboriginal Mission is 4 km west of Lake Condah. It was established in 1867 by the Anglican church and contained several cottages, a church, farm buildings and an orchard. It was officially closed in 1919 and most of the reserve was subdivided for soldier settlement farms. Rubble foundations, pine trees and a few fruit trees mark its prior existence. The Gunditjmara Aboriginal community manages both the Lake Condah and Mission sites. At the 2011 census farming accounted for 36.4% of employment. The 2011 census recorded 24.9% of the population affiliated with the Uniting and Presbyterian churches, compared with 7.8% for Australia. At the 2011 census 2.6% of the population identified as Aboriginal.